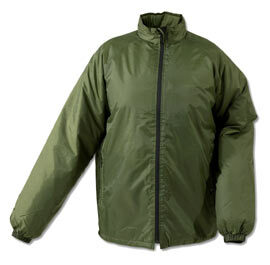 The latest addition to the Ray Mears Bushcraft Online Shop is the Nanok Air Jacket. This hard-to-find piece of kit has been designed as an insulating mid-layer, but has all the properties of an outer jacket, thanks to the durable ripstop nylon outer shell. It’s extremely lightweight, packs down nice and small to fit in your rucksack and is very versatile. Ray and the Woodlore Team wear their Air Jackets out and about in the UK, while they are also perfect for use in colder climates, such as the Arctic; if you have any doubts, just check how comfy Lars Falt looks – that’s normally a good indicator! This entry was posted in Bushcraft Clothing & Equipment on April 22, 2010 by Woodlore Team.